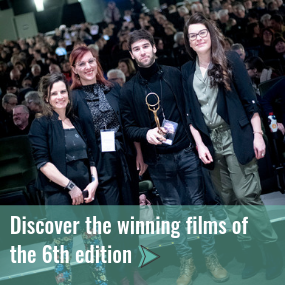 The panel rewards one dramatic feature and one documentary feature chosen among five films submitted for competition in each category. This year panel’s members were Marie Tifo, the panel’s president, Angèle Séguin, Emmanuelle Laroche, Jean Boivin and Alexandre Leclerc, member from the public. 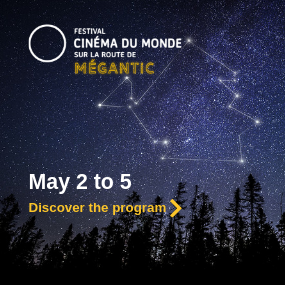 As part of its annual programming, the FCMS hosts a special screening of several short films produced in the Eastern Townships and shortlisted by the selection panel. The panel then bestows on the winning entry the Cercle d’or award for Best Eastern Townships. Emmanuelle Laroche, president of the panel, Ève Lamont and Pascale Rousseau make up the regional competition panel. The Cercle d’or Meilleur court métrage de l’Estrie (Best Eastern Townships Short award), sponsored by La Fabrique culturelle was given to Ponderosa directed by Julien Grégoire Péloquin. The Prix Coup de cœur du public Radio-Canada is voted on by festival goers. The award goes to the public’s favourite dramatic feature film and this the winner is Capharnaüm directed by Nadine Labaki. Two Passports for the Festival’s 2020 edition will be offered by random draw among the voters. The name of the winner will be announced shortly.